Rettig Engineered Products Company was formed in 1993 by Bill Rettig. He leveraged his relationships from preceding Principals to spring forth Rettig Engineered Products. We still maintain a few of these partnerships today. Currently, there are four Outside Sales contacts covering the states of Michigan, Indiana, Ohio, Kentucky, West Virginia and Virginia. Rettig Engineered Products is an Independent Sales Company. We partner with and represent selective quality manufacturers focused on providing technical mechanical and electro-mechanical custom engineered solutions. 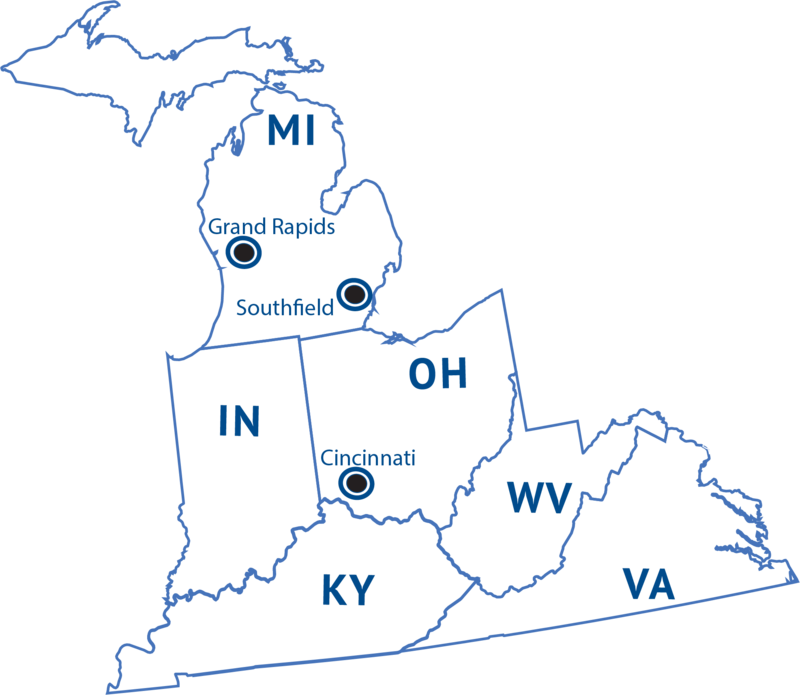 We are located in the Great Lakes Region and currently service Michigan, Indiana, Ohio, Kentucky, Virginia and West Virginia. Customer needs don’t just fall into your lap. We actively seek out potential product lines and customers. We seek referrals from our customers and partners and yes, exercise cold calling skills. The backbone of everything we do is the ability to communicate the needs and wants of our customers and partners. We are able to receive and send out information in a variety of platforms so that no issue will go unseen. Timely responses are a necessity to this fast-paced world. Understanding needs and expectations cannot be achieved without the ability to hear our customers and Principals. We set face to face meeting with customers in order to be present, listen and understand what is being requested. Phone calls and emails are all part of the listening and communicating process by which we hear the needs of our customers. We communicate the needs of our customers with our Principals in order to solve problems. Whether these solutions be a standard product or custom design, every one of our partners has the ability to design and engineer to the most stringent of requirements. We perform the Sales cycle on a daily basis. Whether this be meetings, phone calls or web meetings, the end result the customer needs is the execution of what has been identified, communicated and concluded. We put our customer and Principals in the position to be successful.